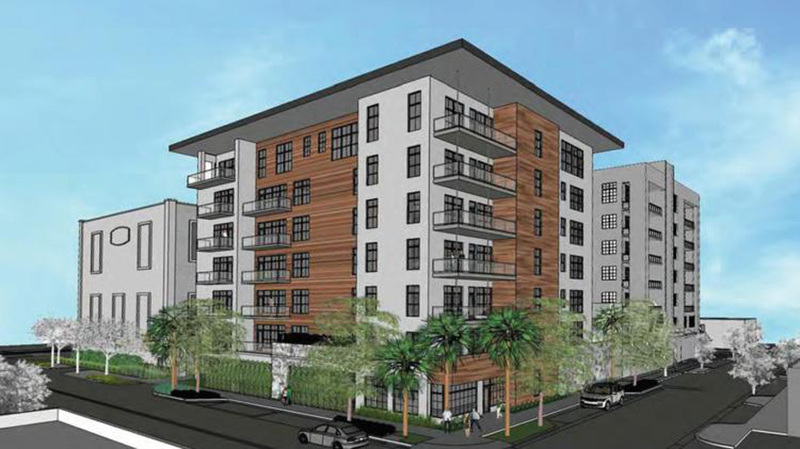 A new 33-unit, loft-style condo development has been proposed for the FAT Village neighborhood just north of Downtown Fort Lauderdale. This building will be built by the same developer as Foundry Lofts, Mill Lofts, and Avenue Lofts. It will be located at 401-403 NW 1 Avenue, directly adjacent to the Foundry Lofts. The developer presented his proposal to the Fort Lauderdale Development Review Committee on January 24th, 2017. Just in the beginning stages, the development still needs multi-departmental city approvals before construction even begins. There are no dates regarding sales available at this time. The current 2-parcels are occupied by a storage warehouse. After demolition, the 7-story Apache Lofts building will be constructed and be attached to The Foundry Lofts, and will share the pool. The building is being designed by Krupnick Studios architectural firm, with interiors similar to the existing lofts (high ceilings, exposed ductwork, extended balconies) and an exterior facade of stucco and wood-look siding.